Above: MC Lachlan Wills approves as Erika Hamilton models “Senorita Ancestor Fiesta”, created by Sarah Hill and Simone Guascoine, highly commended in the Natural Fibre awards. 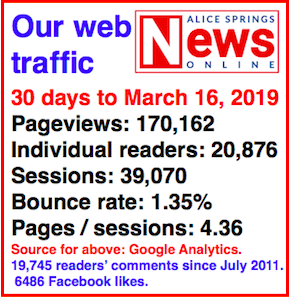 The colours and shapes of the desert, whether on the grand scale of the landscape or up close to the beauty and bounty of the flora, are an unending source of inspiration for Alice Springs artists and audiences alike. 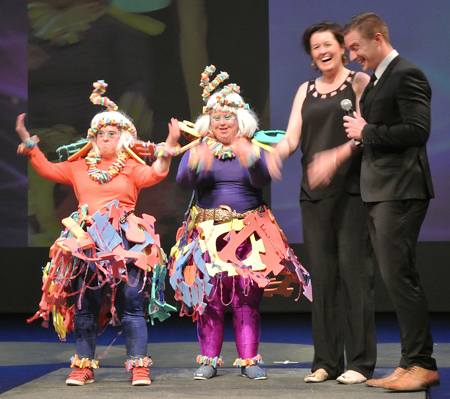 Judges of last night’s Wearable Arts Awards – Brigida Stewart, Liz McAinsh, and Tony Rice – stamped their approval on creations drawing on this source. The night’s top prize, the Central Craft Acquisition Award, went to “Alice … Spend a little time with me” (at right), a cloak and beneath it a dress providing the ‘canvas’ for literally a landscape painting – “the scenery, animals and plants that make Alice Springs the wonderful and alluring destination that it is”. 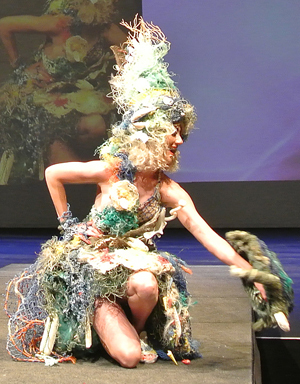 Created by Queenslanders Marge Coogan and Laurel Glegg, and modelled by Jaimee Eaton, it also won in its Fantasia category. 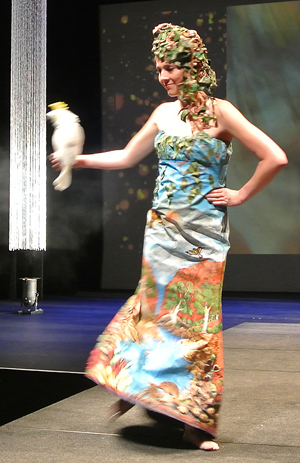 Runner-up for the Acquisition award and winner in the Natural Fibre category was a cornucopia of a gown, titled “Desert Weaver” (below, right). The audience backed the judges, voting for it as runner-up in The People’s Choice Award. Created by Julie Millerick, Marg Johnson and Brenda Smith, it was more than a homage to floral beauty and bounty. Model Sarah Morocco carried a soft sculpture bilby on her arm, making the connection between flora and fauna, between the “finely adapted plants” of the desert and the animals, many of them endangered, that depend on them for survival. It was a very different image of a woman’s life delivered in the next entry, to which the judges awarded runner-up in the category. 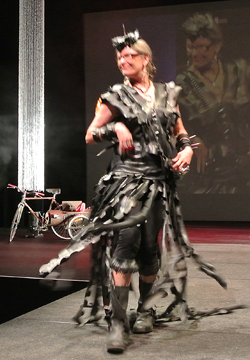 For “Re Cycled”, creator Amelia Missen used recycled bike tubes and other cycle paraphernalia to deck out a pedal-power goddess, a role which model Pia Harrison embraced with gusto. Although Missen was reflecting on the fragility of human life in the unforgiving bush, Harrison certainly looked like she could handle it. The night began with 15 entries from young people. It was great to see boys enter in this category and the people meter (clapping and cheering) definitely delivered an accolade to “The Gladiator”, created by Budi Angeles, Jude Holoi, Kris Curtis-Stenton and Callum Annesley – Callum wowing the crowd with a display of break-dancing. Their paint-splattered canvas kilt and poncho was effective but simple. More work on the wearables, from concept to finish, helped catch the judges’ eye. 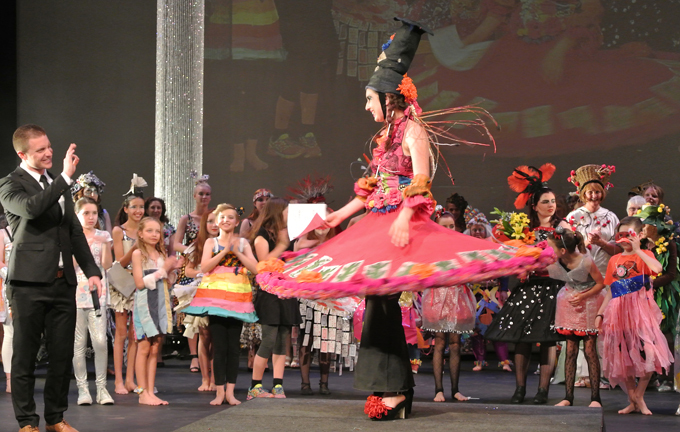 The win went to Lucy Brash, Eliza Freidel and Mia Kurrajong for “To the buttons and beyond”, a dress morphing “punk, princess, and galaxy” with a performance to match. Highly commended went to Alyssa Tinfina for her “Broken Hearts and Shattered Dreams”, made from hundreds of playing cards. 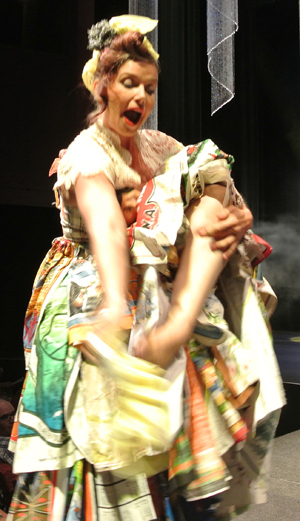 Despite its history of breaking, and thus threatening the end of her dreams, the dress survived the night’s performance very well, and also helped deliver Alyssa a highly commended in the First-time Entrant Award. This award could conceivably have gone to an adult but the win was taken by the talented Ali Anderson, a Grade Six student, for “Tattered Dress”. She also won the Performance Award, likewise open to all categories. 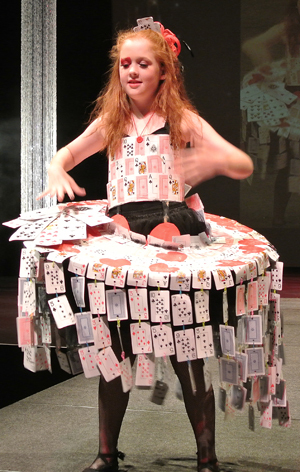 The ‘wearable’ part of her entry was simple enough, but she had developed a character and storyline for her performance that she carried off with impressive drama and timing. Her character, Aurora, has become “stuck in an imaginary world of her own and has to fight to get out,” she wrote in her entrant’s statement. “No is not an option and she will win.” And so she did. People meter and judges were in unison in delivering a heartfelt accolade to visiting entrants from Melbourne, The Alkira Wearable Art Group, for “I love the 80s”, modelled by Tara Scott and Sarah Laycock. Scott was also the artistic director of the performance. They won the Encouragement award for their entry in the Recycled category, for their “punk princess” pieces made from coloured foam and plastic curtains raided from the donations pile of the Alkira Op Shop. There was a second effective and touching entry from this group in the Fantasia section, the trip to Alice made possible by a crowd-funding campaign. 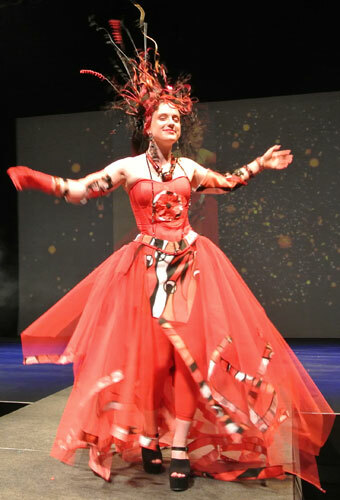 This was the 14th iteration of the Alice Springs Wearable Arts Awards. Once again the show sold out, with many people unable to get tickets, and once again, there was enough depth in the entries to make deciding on winners no easy task. It’s an event that keeps on giving. 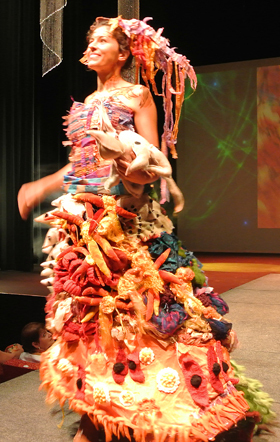 Below: Jasmine Bates in “Fire Gown”, highly commended in the Fantasia category, created by Robyn Caughlan, a special guest of the night, the only Aboriginal designer to have multiple commissions to design national costumes for international beauty pageants. The audience was treated to a showcase of five of these creations, including the one shown to the right. Below, from top: Kristy Schubert in “Chux SuperWife” • Pia Harrison in “Re Cycled” • Callum Annesley in “The Gladiator” • Lucy Brash (foreground), Eliza Freidel and Mia Kurrajong in “To the buttons and beyond” • Alyssa Tinfina in “Broken hearts and Shattered Dreams” • Ali Anderson in “The Tattered Dress”. If you can see this, then you might need a Flash Player upgrade or you need to install Flash Player if it's missing. Get Flash Player from Adobe. This error may appear if the URL path to the embedded object is broken or you have connectivity issue to the embedded object. 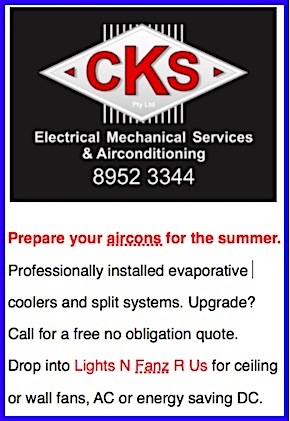 Powered BY XVE Various Embed. 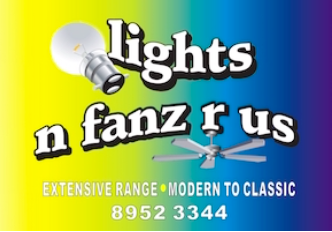 PLEASE NOTE: The video’s audio had to be changed because of music copyright. Great. Thanks, Philomena, for sending. Such a fantastic Wonderland event that manages to out do itself with every year. 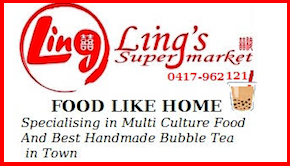 Such talented, gifted people that our colourful fabric of community manages to capture with flair and sophistication. Congratulations to you all for another year of festive fabulousness! Fabulous, fun and enjoyable night. Great combining the youth and adults parades in one show. 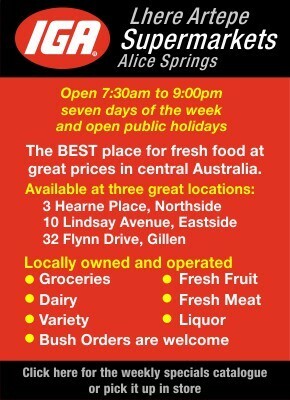 A true Alice Springs highlight.